Want a burger to match your soul? 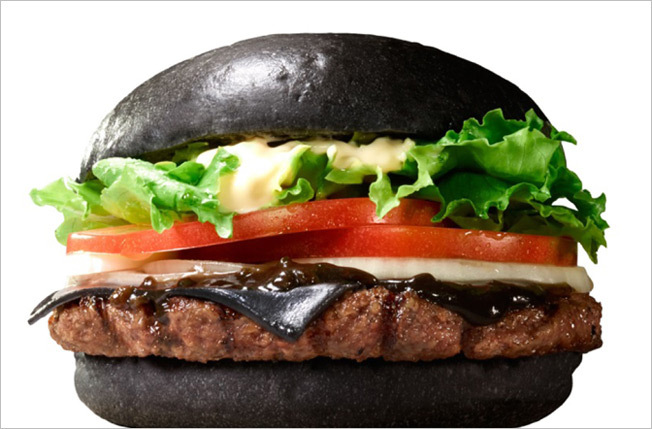 Burger King Japan's black burgers may fit the bill. The Kuro Burger—translation, "black burger"—and deluxe sibling the Kuro Diamond Burger don dark trimmings, including a black bun made from squid ink and bamboo charcoal, as well as black cheese infused with bamboo charcoal (or possibly from emo cows). Oh, and that dark, oozing substance? That's black onion, garlic and squid ink sauce. To be fair, these burgers are back in black. Kotaku says both McDonald's China and Burger King Japan debuted ebony eats in 2012. That same year French fast-food chain Quick blackened its buns to honor Darth Vader in a Star Wars-themed burger series. Embrace your dark side starting Sept. 19. Via The Wall Street Journal's Japan Real Time.